Crazy how a year has gone by just like that isn't it? I cannot believe it is 2016. It's customary to set some goals or resolutions for the year ahead. I have been thinking a lot about these for a while because not so long ago I got told some news that has made me question a lot of things and doubt myself a lot more. I'm not going into them just yet because they're a bit fresh and personal but as a result I've found myself altering and shifting my goals and in turn, my mindset. I have a feeling that this year will be a tough one for me. In fact, I know it will be. There are going to be many bumps in the road -some more painful than others- that I'll have to overcome so I guess my main goal is to stay strong no matter what life throws at me. My next goal is to find some happiness and if I can't find it, I have to create it for myself. If this year isn't kind to me I'm going to need those moments of happiness to get me through and remind myself that it will be okay. 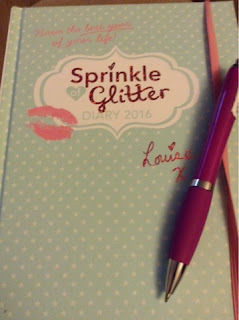 Another goal is to keep up with filling in and updating my diary. As you can see I have the Sprinkle Of Glitter one which is already a joy to open every day so it shouldn't be hard to stick to this one! Pure vanity now but I want to lose quite a bit of weight. I don't feel comfortable in myself at the moment. I can't stand my reflection and don't like my body so I want to use 2016 to do something about it. Lastly I want to build on existing friendships and create some new ones. I have spent far too long holding myself back and not opening up to people and where has it got me? Nowhere. I want to go into 2017 with good, strong friendships. Have you made any resolutions/goals?